After switching careers from business management to fashion, fashion designer Marga Weimans (1970) graduated from the Antwerp Academy of Fine Arts in 2005. 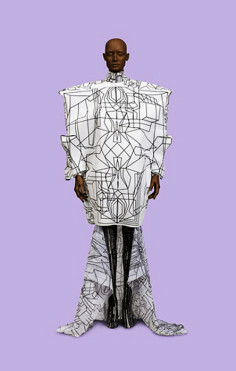 Weimans won the i-D magazine Award for her graduation collection “The Power of my dreams”. The prize was work experience at the London i-D magazine headquarters. Weimans returned to the Netherlands and founded her namesake couture label. Weimans work, while highly biographical, experiments with materials and pushes the boundaries of art, architecture and design. Weimans showed her collection ”Debut” of, “2” and “Wonderland” off schedule during Haute Couture week in Paris and was featured in a number of exhibitions. The Groninger Museum is a regular collector of the work and momentarily exhibits pieces of the whimsical Wonderland collection in the group exhibit “Material world” with a.o. Iris van Herpen, Joris Laarman en Pieke Bergmans. “The Green Landscape dress” made out of coated foam, served as an icon for the exhibition and was printed on everything from the museums façade, to cakes and to nationwide distributed poster campaign.